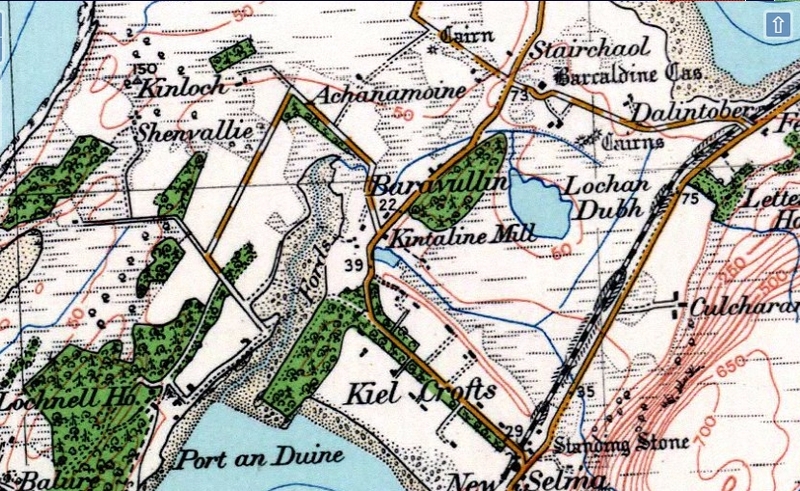 Part of Lochnell Estate until 1950's. 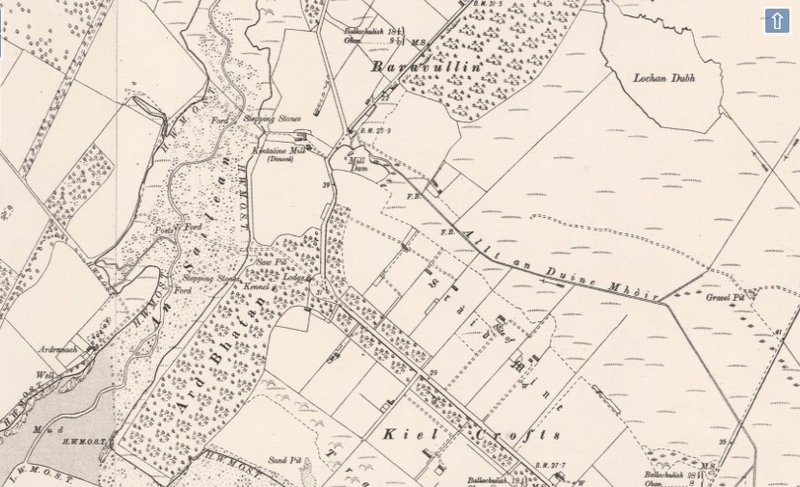 One unroofed and four roofed buildings annotated as Kintaline Mill (Corn) are depicted on the 1st edition of the OS 6-inch map (Argyllshire 1875, sheet lxxiii). Three roofed buildings are shown on the current edition of the OS 1:10000 map (1977). The farm house was built around 1750, as a simple single storey building, which was made to 1 1/2 storey in the 1800's, then added to around 1875, and again in the 1950's. The byre is a winnowing byre, with the doors opposite each other, with cattle stalls in the lower end, and horse stalls in the top end. The barn was once the Mill building, with a separate grain receiving area with a door on to the yard, where cart loads of oats and barley was brought from crofts in the area - there was a fire below to dry out the grain, a shoot took it into the mill workings next door. This grain building was converted into living accommodation - maybe for lodgers in the latter 1890's and for the family in the 1900's when they rented out the farm house for tourists. 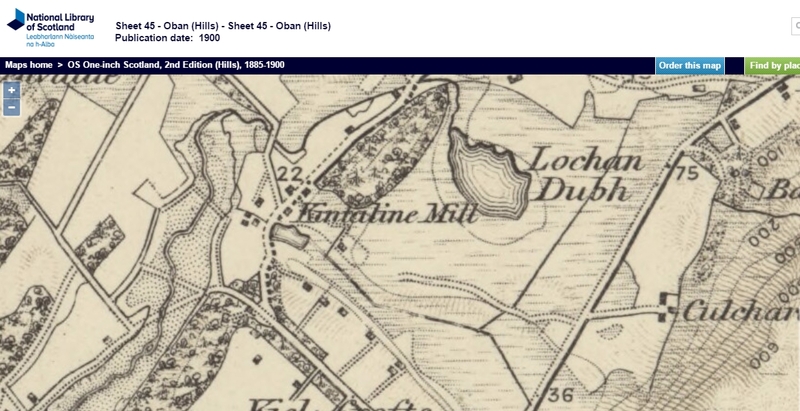 Land Tax records - Corn Mill of Kintailen - One pound thirteen shillings & four pence / Croft of Kintailen - Four shillings & seven pence. 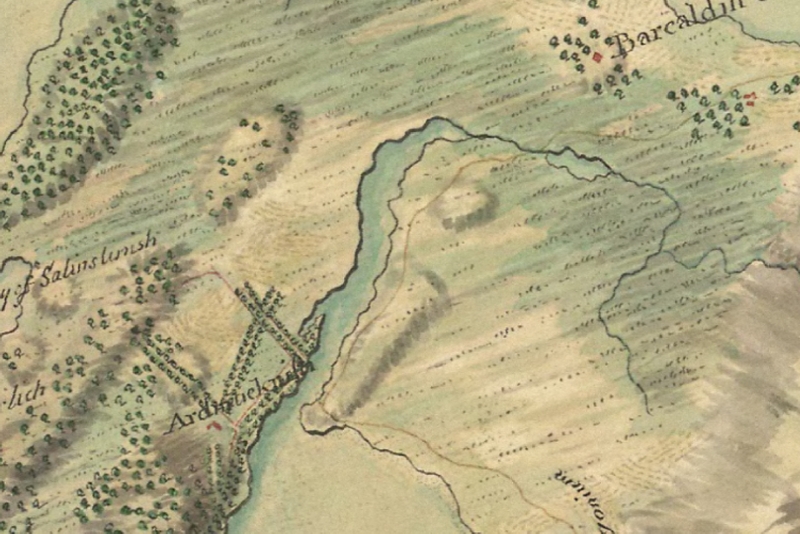 The Roy Military Map does not show a stone building here, which either means it was drawn up before the Mill is built which is now unlikely, or that Kintaline is omitted. The Roy map was the first detailed measured map but does not have everything drawn in it. The detail of settlements came mostly from other maps, and it is likely this is out of date. The line of the road is below the hill, and it is quite probable that when Lochnell estate started to improve the lands around it, with draining, this would have been when the wall was set up that is now along the roadside at the top of the hill rise. The material for this wall came from the Neolithic burial cist that lies along the road. The wall meant that livestock could be excluded from the land to the shoreside, allowing it to be drained and improved for arable growing. This action, copied across the estate, would provide far more yield of crop to justify the establishment of the mill. Neolithic Burial Kist lies close to the road, yet another illustration of the considerable activity throughout the prehistoric era in this area. It would have originally been a mound, like this below, but the stone has been used over the years, maybe to build the farmhouse and mill, certainly to create the wall that is now alongside the road. The cist was recorded by Robert Angus Smith in the 1870's, at which time it was covered by a small cairn. This material has since disappeared. The cist was re-examined in 1963 (Reid 1963) and a large number of white quartz pebbles, many small fragments of bone and a tooth were recovered from it. The cover of the burial cist was reused when the house was extended in the 1870's, and is now in place as the lintel of the fireplace in the farmhouse. RCAHMS 1975, visited April 1967.